to print - he does it all. He is an absolute pleasure to work with, and provides all this at very good value. to be a man of high integrity, has never missed a dealdine and always delivers. communicate perfectly. I didn’t expect our hardest choice would be picking which design we liked best. Scott is as a well-organized, talented designer. He is one of those "go to" guys you want to keep around. Scott's has a thirst for information and is always expanding his industry knowledge and skill sets. his stuff. I highly recommend Blenderhouse Creative for your next web project. to his attention to detail and creativity ... the final result is the perfect website for my business. Scott has been a Godsend to our organization. He is fast, accurate and reasonably priced! I've worked with Scott for 15+ years. He's extremely skilled and talented as a designer and developer. Most importantly, Scott sincerely cares about our clients' success. I'm blessed to have him by my side. has great attention to detail, and knows exactly how to achieve what the client is looking for. and usable is simply unrivaled. I recommend him without hesitation. Our websites are custom designed and expertly branded, built from the ground up to attract your target market. They are responsive so they look great on any device, built on WordPress for easy editing and optimized to be fast and Search Engine friendly. Basically, our websites provide all the tools you need for success, mixed together into one package! Your website is a powerful tool, but no one will find you unless you tell them about it! We can start you out with everything you need to promote your new website! Social media, email marketing, blog, even business cards and more. Need a new logo or an upgrade? We got you covered! We design everything to match your new website to ensure a unified, cohesive brand. We enjoy working with like minded creatives and marketers because we get you … we are you! Designers, writers, illustrators, developers, marketers and PR experts, either big time agency or freelance, we can help! The best part is that we can also partner with you to provide OUR SERVICES to YOUR CLIENTS. Everything is white label so to them we are just part or YOUR team. Ready to get started? 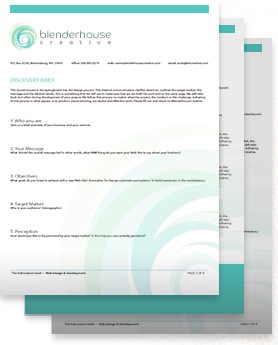 Download our FREE Website Planner. This comprehensive workbook is a road map that will help guide your websites strategy. This creative brief becomes the spring board we will use when planning and designing your website. We can go thorough it together but it's best that you do your homework before we speak. Check out some of our recent projects below. Click here to view our full portoflio.